Eyes gravitate toward Brian Jungen’s work. On the surface, unexpected combinations make us wonder at the artist’s creativity. Looking more deeply, we find Jungen exploring identity in a way that resonates and challenges. Jungen’s sculptural work The Mom Call acts like a stage where the forces of artistic choice and influence collide. The artist’s choices are unique. They also make very clear references to the life experiences that have shaped him. A combination of family and artistic heritage helped to bring about these choices, and in Jungen’s work, we see the artist physically molding a multi-faceted identity for himself. In The Mom Call, Jungen has appropriated a chair produced for a notable 1940 design competition. By sampling the winning chair, he brings into his work the exclusive, European, bourgeois connotations linked to high-end design. The chair, though, is swallowed up in American elk hide, which is drawn taut by tarred twine according to traditional Native methods, forming a funny-looking—but functional—drum. Jungen was born in Fort St. John, British Columbia, to a Swiss-Canadian father and a Native mother of the Dane-zaa Nation. That dual heritage plays out in fascinating ways in Jungen’s work, where we can see him navigating his ancestries and finding a place among them. A defining characteristic to his work is the clever re-use of objects. The creative vision Jungen displays when transforming Nike Air Jordans into Native-inspired masks, or when constructing whale skeleton replicas from petroleum-based plastics, is the meat and potatoes of his artistry, and he traces that habit of re-appropriating back to his mom. As a child, he would watch his mother and her family use objects outside of their original purposes to get stuff done. This “improvisatory recycling,” as Jungen calls it, was driven by necessity, but it also reflected a habit of looking at things for their potential, rather than their intention. Jungen learned from his mother how to be resourceful, how to deconstruct a known thing and create a new meaning for it. Back to The Mom Call: The clean lines and the industrial, artificial quality of a modern piece of designer furniture give way to a sloping, organic form. The elk hide covers the chair, hiding its details but revealing its form, and changing its use, but not in a one-to-one transition. 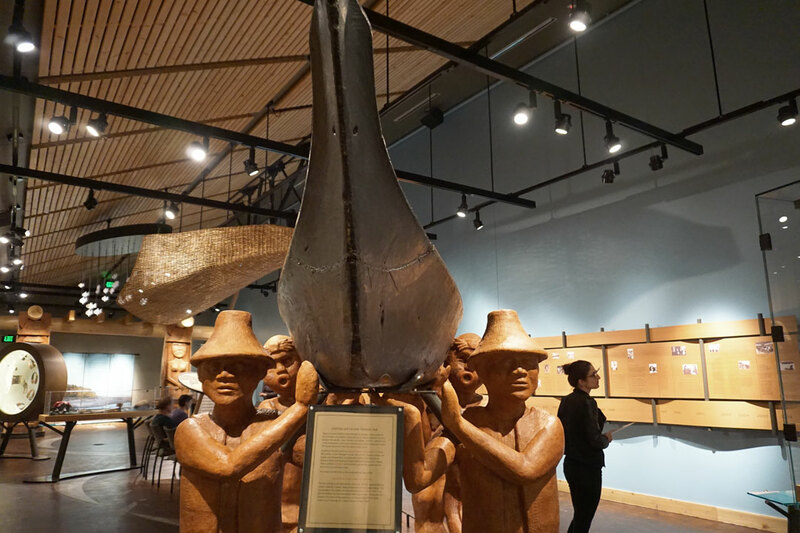 When we look at The Mom Call, we’re several steps removed from the item’s original function—chair as chair becomes chair as art object becomes chair-drum as functional art object (and museum exhibit, and so on). Influences, uses, interpretations, contexts, and perspectives all come into play. In this piece, Jungen displays original thinking about forms and how they communicate to us. Tragically, Jungen lost both his parents in a fire when he was just seven. Through his art, the legacy of both his folks, but especially that of his mom—a woman who he says was “always trying to extend the life of things” 1—remains. P.S. Brian Jungen’s mom made a difference—as moms do! Happy Mother’s Day to my mom and all our SAM Blog-reading moms! 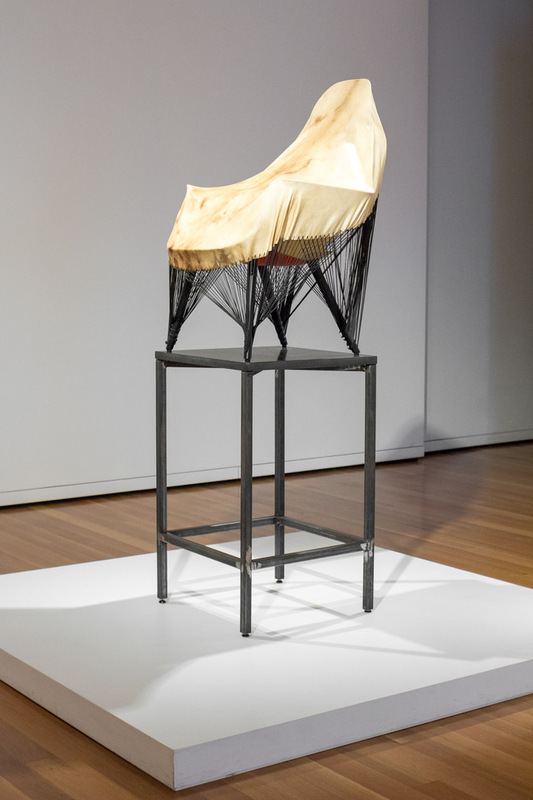 Image: The Mom Call, 2011, Brian Jungen (Canadian, born 1970), Organic Chair by Eero Saarinen and Charles Eames, American elk hide, tarred twine, steel, granite, 80 1/4 x 33 x 29 1/2 in. Seattle Art Museum, Gift of the Contemporary Collectors Forum, 2014.34, © Brian Jungen, Photo: Natali Wiseman.